Together We Cope is located in Tinley Park at 17010 Oak Park Ave.
We are a homeless prevention agency based in Tinley Park, Illinois. Our mission is to bridge the gap for Southland residents in temporary crisis. We provide food, shelter, clothing and referrals to help them return to self-sufficiency. We help others overcome temporary financial challenges. We provide basic necessities like food, shampoo, diapers and clothing. We help with past due rent, mortgage, or utility payments. Our efforts allow families and individuals in temporary crisis to stretch their own dollars even further thus enabling them to stay in their homes. We are a homeless prevention agency serving 27 communities. 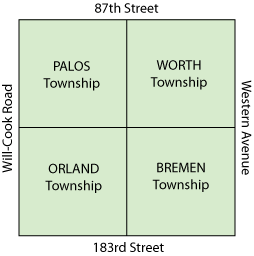 We serve four townships in Chicago’s south suburbs — Orland, Palos, Worth, and Bremen Townships. When people support Together We Cope, they help your neighbors stay in their homes. That makes the community stronger for all of us. Helping families in crisis is the mission of Together We Cope. Everyone can help — students, members of local organizations, business owners and managers. Our board members and officers provide top-notch guidance, important to any organization. IRS Forms 990, Annual Financial Reports, Illinois Forms AG 990 are posted and available online. The amount of total expense that goes directly to the charitable purpose is one factor considered when our overall score and rating as a charitable organization is calculated. The percentage of our total expenses spent on the programs and services we deliver is currently 92.8%. Year after year we score in the 90%+ range. Read Together We Cope newsletters online and get acquainted. Together We Cope assists neighbors in need in four townships. Our service area is bounded by 87th street and 183rd Street and between Will-Cook Road (County Line Road) and Western Avenue. Residents of this area (excluding the Mt. Greenwood neighborhood) are eligible for assistance from Together We Cope.